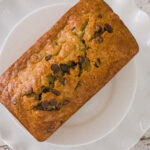 This delicious Chocolate Chip Banana Bread recipe is quick, easy, and the perfect way to use up overripe bananas. Preheat oven to 350 degrees F. Butter a 4×8 loaf pan. In a large mixing bowl, mash the bananas until smooth. Stir in the melted butter. Continue to mix in salt, baking soda, sugar, egg, and vanilla extract until completely incorporated. Add flour and chocolate chips, fold in until no streaks remain. Pour batter into loaf pan, and bake for 50 minutes to an hour, or until an inserted toothpick comes out clean. Remove from oven, and cool on a wire rack. Serve! Tip: Using previously frozen bananas results in even moister banana bread. But I’m personally fine with just 3-4 overripe bananas that never had to spend any time in the freezer.